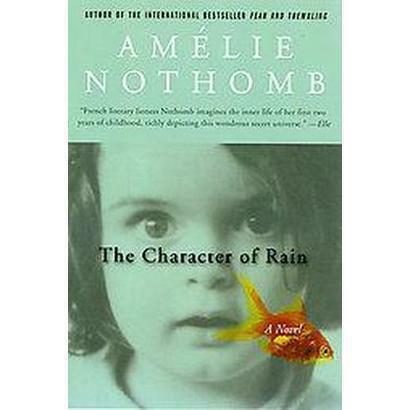 Amelie Nothomb has a reputation in Europe for being a “precocious” and very talented writer. I hadn’t heard of her at all until a friend with ILT (impeccable literary taste) waxed rhapsodic about a recent Nothomb binge she undertook. Having read one of this author’s works, my ILT friend assured me, there was simply no stopping until she’d continued through them all. My ILT friend and I are prone to binge-reading (and I’m frankly highly suggestible by nature), and it didn’t take long for me to check the library’s online catalog to see what titles were available within the system. And, impressively, there were lots to choose from, both in Nothomb’s native French and also in translation. I chose three titles that sounded good, and ordered those straightaway. 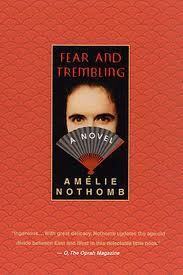 The first Nothomb title I read was Fear and Trembling, a novel about a young Belgian woman’s struggles to gain respect working in a Japanese company. That may sound very straight-forward, but this book is anything but that. Nothomb eases us into the book gently, slowly piling on episode after episode as the main character (also Amelie) suffers continued humiliations at the hands of her Japanese bosses. She does this in a way that’s both horrifying and humorous, at the same time, showing great writing prowess. Impressive, to say the least. The book reminded me, in some ways, of the film Lost in Translation. It had that general sort of humorous edge to it, with a dash of surrealism thrown in for good measure. Definitely not a pedestrian, run of the mill sort of novel. It nudges more into experimental fiction, yet it’s also very far from what I’d call Ulysses Syndrome. I have a definite limit when it comes to reading this sort of post-modern, experimental writing, and Nothomb thankfully never quite pushed me out of that comfort zone. 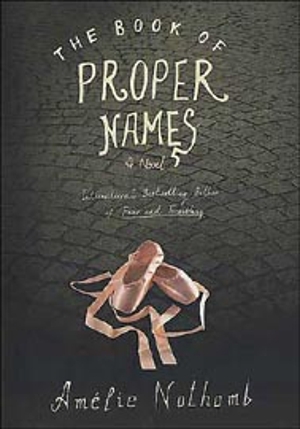 The Book of Proper Names was the second book in my Nothomb evening (each book is short, each taking me less than an hour to read). The style of the book is very similar to Fear and Trembling, but the book has a deadpan horror element to it that makes it darker in tone. The book begins with a very young couple who are expecting a baby. The wife is all of about 19 years old, and the couple lives with the young woman’s parents as they are nowhere near being able to support themselves. In her ninth month of pregnancy the woman, Lucette, gets in an argument over names for the baby. When her husband expresses his desire for what she considers very pedestrian names, Lucette shoots him dead. The rest of the book deals with the daughter of this union, born in the prison in which Lucette is serving her sentence for murder. Lucette names her daughter Plectrude, despite the protests of the doctor and guards in the prison, who warn her she’ll be made fun of mercilessly for such a strange name. But Lucette is insistent. Plectrude is a dancer, with “a dancer’s eyes,” and has no aptitude or really any patience for anything else. She’s driven to become a dancer, starving herself to fit the role of the tiny, graceful ballerina. The rest of the book outlines Plectrude’s legacy, as the daughter of the not quite of this world Lucette, and the apple hasn’t fallen far from the tree. Finally, I read The Character of Rain, which turned out to be my favorite of the three books. In this book Nothomb writes about her first three years of life, growing up in Japan where her father worked as a Japanese consul. The book is, as expected, semi-autobiographical, written in Nothomb’s own brand of magical realism- inspired prose. It’s tremendously imaginative, and sometimes funny, sometimes horrific. Young Amelie, until the age of three, thinks of herself as God. She doesn’t make a noise, or even move a muscle, until age two and a half. Her parents call her “the Plant.” In other words, she takes in food and grows, but she has no more interaction with them than a houseplant. Inexplicably, one day Amelie sits up and begins screaming. She barely pauses to take a breath until the arrival of her grandmother, who hands her a piece of white Belgian chocolate. Amelie is finally transformed into a normal toddler, learning to talk and walk, thanks to the Magic of Chocolate. What happens in the rest of the book is quite possibly even more strange and wondrous than in the early part, and once again Nothomb leaves us uncertain whether we should feel happy or unsettled. Her prose style is, throughout all the books, impressive. I may read yet more by Nothomb, but after an evening spent reading three of her books I’m feeling mentally drained. It may be a while before I try her again, but I’m thrilled to have found such a singularly interesting writer I’d never heard of before.